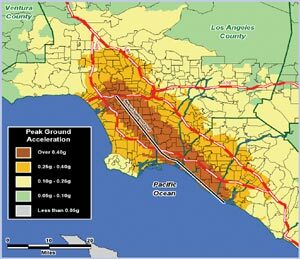 Showing ground acceleration relative to the NewportInglewood Fault. Nationwide, the recognition of hazard vulnerability is growing. As a result, planners are reevaluating their communities' exposure to risks and considering proactive hazard mitigation measures. Such planning was given a boost in October 2000 when the Disaster Mitigation Act (DMA) was signed into law. DMA 2000 encourages and rewards predisaster planning, calling for increased coordination between state and local governments. Interim final regulations published in February 2002 require communities to complete mitigation plans in order to receive hazard mitigation funds. Often the greatest challenge in developing such plans is their scope. Reaching an understanding of how to prepare for, mitigate, respond to, and recover from hazards is a complicated journey. And as all aspects of hazard planning are interrelated, data compilation, evaluation, maintenance, and standardization create an imposing hurdle. Comprehensive community planning relies on understanding risks to the physical, social, and economic components of a community. Only communities that understand their vulnerability to natural hazards can make informed decisions. The Federal Emergency Management Agency (FEMA) latest risk assessment and loss estimation software package, HAZUS-MH (Multi-Hazard), can help answer complex hazard planning questions. By using their existing GIS in conjunction with HAZUS-MH tools, planners can integrate and analyze earthquake, hurricane wind, and flood information. HAZUS-MH maps and displays hazard data, facilitating real-time support for natural disaster response and recovery as well as economic loss estimates for buildings and infrastructure. 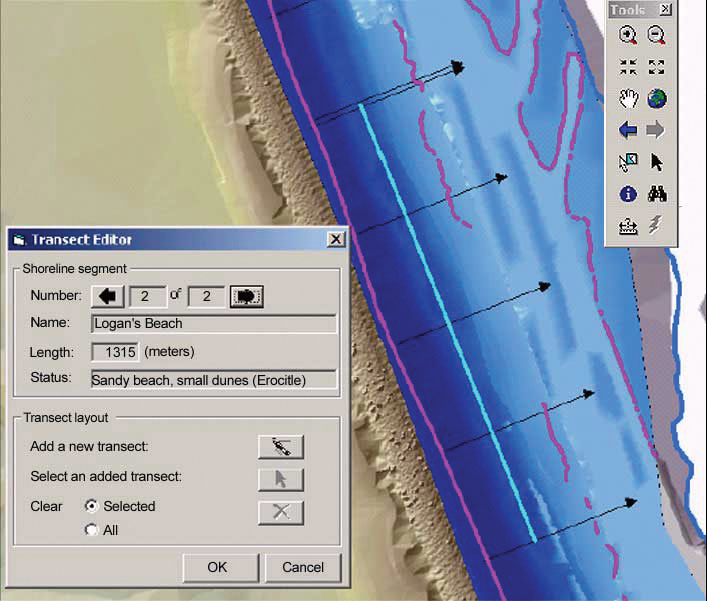 While a previous version of this software was made available in 1999, the upgraded HAZUS-MH provides emergency managers with new loss estimation tools for hurricane wind and flooding while taking advantage of the ArcGIS software platform. 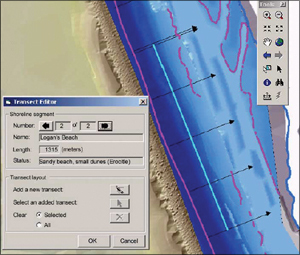 It is simple to divide shorelines into zones of common physical characteristics. HAZUS-MH can quantify the risk for a study area of any size, whether for a region, state, community, or neighborhood. Using ArcGIS technology, HAZUS-MH combines hazard layers with national databases, then applies standardized loss estimation and risk assessment methodology. The GIS environment allows users to create graphic presentations, helping communities visualize and understand their hazard risks and solutions. 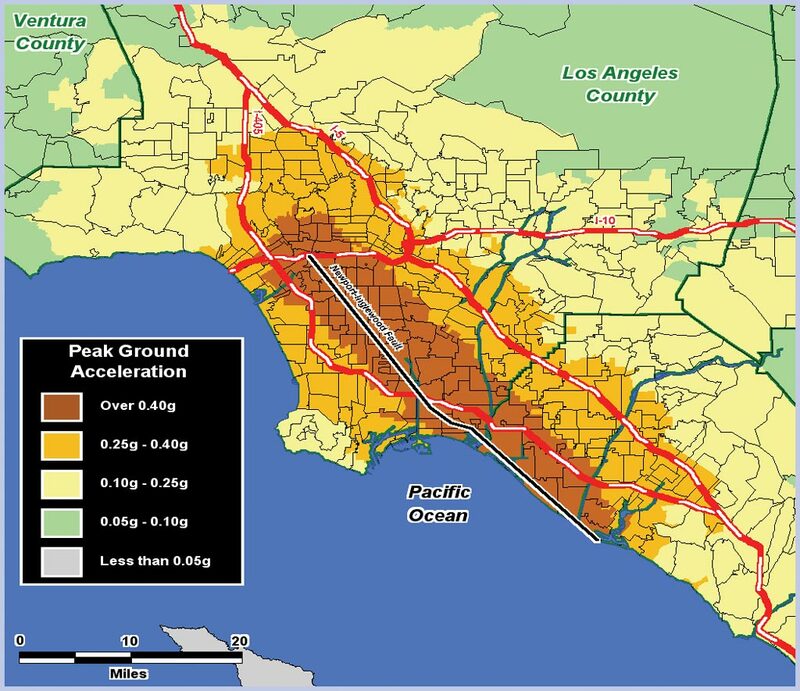 Earthquake ModelThis model provides estimates of damage and loss to buildings, essential facilities, transportation and utility lifelines, and population based on scenario or probabilistic earthquakes. In addition to estimating direct damage, the new model addresses debris generation, fires, casualties, and shelter requirements. Hurricane Wind ModelWith this model users can consider any possible hurricane winds, as well as historic hurricanes, to estimate potential damage and economic losses to residential, commercial, and industrial buildings in states along the Atlantic and Gulf Coasts. Flood ModelFlood risk is determined by nationwide data sets through analyses of possible flooding based on hydrologic information. The Flood Model allows users to characterize flooding and then estimate expected levels of damage to buildings and infrastructure. Third party hazard models that address hazardous material releases and dam breaks are also accessible with HAZUS-MH. By providing this software free of charge, FEMA hopes to facilitate effective hazard mitigation. Anticipating the scope of disaster-related damage and identifying areas of special concern can help protect the lives and livelihood of a community. For more information and training opportunities, send an e-mail to hazus@fema.gov.